More wireless users mean more needed bandwidth. The proliferation of mobile devices and rapidly increasing data requirements are challenging IT departments every day. Business as usual just isn’t enough anymore. Thankfully, Baynetwork deploys the right solutions to fit your wireless needs and solve your bandwidth headaches. We create an agile and supportive infrastructure that meets your requirements now and can grow with the requirements that you will need tomorrow. 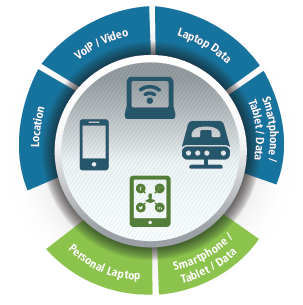 Our solutions include multi-carrier 3G and 4G as well as 802.11 a/b/g/n/ac Wi-Fi. In addition, we will prepare you for the future technologies of 5G and 801.11ax. We optimize WLAN performance for computers at both 2.4MHz and 5GHz for high-density deployments. The WLAN landscape is still evolving. The use of mobile devices like smartphones and tablets for business purposes will continue to grow and change, and other business-specific hardware like medical devices, PG&E meters, autonomous cars and rental transportation (scooters, bicycles, etc.) require even greater Wi-Fi coverage and performance. Baynetwork has many years of IT experience and will construct the WLAN network your business needs to succeed. Baynetwork delivers the right solution to fit your mission-critical wireless needs, creating an agile and supportive infrastructure for both immediate requirements and future growth. Our team of engineers works with you to create the best solution to meet your facility and budgetary requirements, and will help ensure a positive return on your IT investment. If you are ready to speak with one of our knowledgeable consultants, call or fill out our online form below.